What makes you, you? Is it your mother tongue? Is it your country of birth? Is it your ethnicity? Is it your bank balance? Or, could it be who or what you call God? 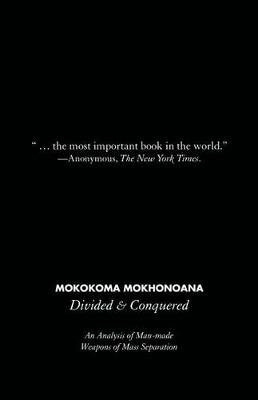 Mokokoma takes the reader through a mental tour. An exploration of social constructs that have divided the human race, i.e., language, culture, nationality, the monetary system, religion, ethnicity, race, et cetera. A journey through familiar territories. But, for a change, with an unfamiliar set of eyes. If this book does not un-divide the human race, nothing will. Mokokoma argues that the civilized man is technologically ahead of-but intellectually behind-his time. This one of a kind life-changing book is our opportunity to catch up.